Indian agriculture is currently in a precarious state with extended glut and farmer unrest across the country. Farm income has gone down despite high foodgrain and horticulture production in the last two years. This is worrisome. The government is scrambling for solutions. It has come up with alternative schemes of procurement and compensation mechanism for crops, which are distortionary and unsustainable in the long run, besides being a fiscal burden. Inefficient crop monitoring, lack of policy preparedness and inadequate crop insurance have been a source of predicament for the farmers and have long plagued India’s agriculture. An important aspect of a long-term agriculture policy will be to counter these issues through technological intervention, which is also a requisite for productivity enhancement. The government of India has recently announced a new drone policy that permits use of unmanned aerial vehicles (UAV) with a few rules and regulations in place. The regulations are expected to come into place on 1 December, 2018. This is good news for the agriculture sector because drone technology is a potent solution for crop monitoring and crop insurance that can help the farm community, as well as in smoothening out fluctuations in the agri-commodity space. 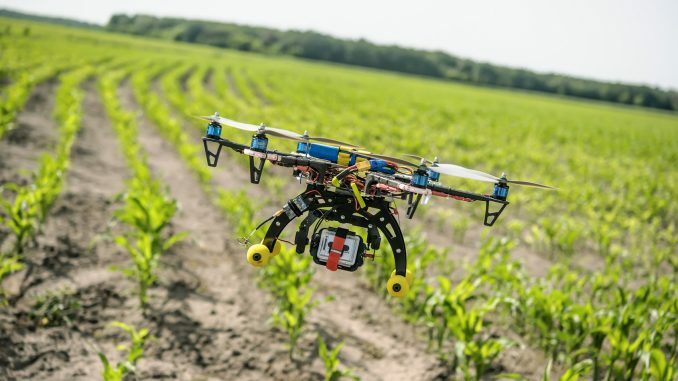 Use of drone technology in crop monitoring: Remotely piloted aircraft system (RPAS), commonly known as drones, is the technology platform that can be put into use in various industries, including agriculture. There are several applications of using drones in agriculture monitoring, which include crop loss assessment in case of any localised event (pest attack, hail storm damage, etc. ), soil health scans, crop health monitoring, field and irrigation tracking, estimation of yield and analysis of data for prompt action. Equipped with sensors, drones flying over a field can collect plant height measurements by gathering range information from the plant canopy and the ground below. Drones with infrared sensors can create vegetation index images, indicating which plants are healthy and absorbing maximum sunlight. Drones can also create satellite maps, which can help farmers make decisions about fertilizers—a major concern of farmers, as fertilizers constitute a major portion of input costs. GPS maps of fields can also help agricultural extension workers, researchers and farmers to plan where to plant crops to maximize the use of land, soil and water. The advantages are clear. The multitude of data generated on a real-time basis through smooth scouting over farm fields can help in efficient resource utilisation and providing timely advisory to farmers—issuing forewarning, or for providing guidance on crop management. Be it the pink bollworm for cotton or the recent armyworm attack on maize, farm management practices in India have been short of the mark and have resulted in losses for farmers. Highly mechanized drones, which can sow seeds, apply fertilizers and spray pesticides, are also being experimented with in the country. Drone monitoring will also aid policy preparedness of the government to tackle anticipated market distortions and could be a welcome escape from desperate fire-fighting measures. One of the most important uses of drones in the Indian context, however, is their use for settlement of compensation under crop insurance schemes. The existing Pradhan Mantri Fasal Bima Yojana (PMFBY) unfortunately still relies on physical and time-consuming crop-cutting experiments (CCE) to estimate crop size and yield. This has resulted in inefficient and delayed payouts. There has been a drop of 14% in the area covered under PMFBY in 2017-18 from 2016-17. The existing deficiencies in the insurance scheme have added to the woes of distressed farmers. Rather than resorting to ad hoc alternatives such as loan waivers, the government needs to focus and channelize resources towards strengthening crop insurance based on drone monitoring. The full visual of a field through drones gives crop insights that aren’t always noticeable on foot or with traditional land-based methods. Use of drones will shorten the timelines for payouts and increase accuracy for crop insurance claims. Drone technology will also be instrumental in detecting insurance frauds and ascertaining flood insurance risk. It is thus high time that the crop insurance sector embraces drone technology. Thus, by capturing large areas in a very less time, and facilitating mapping and analysis at low costs, drones can help increase the efficiency of the agriculture industry, farm incomes and revamp the crop insurance sector. Notwithstanding the regulatory hurdles, the government should mandate the use of drones for determining crop loss and yields for claim settlements under crop insurance schemes. This needs to be implemented with minimum correction in premiums for the farmers. With farming in the global world getting increasingly automated, the Indian government needs to invest and incentivise investment in drone technology for agriculture. A drive for wide-scale awareness and adoption of drone technology in agriculture needs to be undertaken. An information dissemination network needs to be established to issue drone advisory to small farmers. Wide-scale adoption will provide a platform for sustainable solutions for mitigating farm risk and farmer distress.